I was loading up the car to get ready to leave yesterday morning when I happened to look over and see a deer looking at me from our neighbors' yard! Our neighbors had mentioned seeing deer in their yard a little while back, but I didn't think we'd see them again. Ta da! I'm sorry that they are so small in my photo - I was scrambling to get a shot of them before they were gone. Thank goodness for the wetlands, streams and their buffers in our area to provide a little bit of cover for them, I guess. 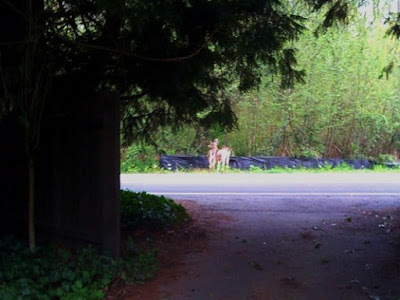 I saw them again in the evening grazing on the front lawn of a house on 80th between 192nd and 195th. I've personally only seen a deer once before in our neighborhood. I was waiting for the school bus to drop off my son after school, when suddenly I was completely shocked to see a deer bound through our yard and across the street. That was several years ago. We are seeing more mallard action in our yard this year than we have before. There have been two different pairs hanging out in the stream. Both pairs act like they are fairly used to people, whereas in the past any mallards that were in our yard seemed very "wild". I don't know how they can possibly have a nest around here that the raccoons won't get.